Sorry, this entry is only available in Ukrainian, Russian and Qt. Sorry, this entry is only available in Ukrainian and Qt. The history of establishment of the Mission of the President of Ukraine in the Autonomous Republic of Crimea dates back to the Declaration of the Ukrainian Independence in 1991 and constitutional government of the President of Ukraine, since restoration of the Autonomous Republic of Crimea as a part of Ukraine. The Law of Ukraine No. 2167-XII “On the Representatives of the President of Ukraine” was approved on the 05th day of March, 1992. The Article 18 of the indicated law stipulates that the status of the Mission of the President of Ukraine in the Republic of Crimea is determined by a separate law. On the 17th day of December, 1992 the Verkhovna Rada of Ukraine adopted the Law of Ukraine No. 2875-XII “On the Mission of the President of Ukraine in the Republic of Crimea”. Historically, the date of its enactment is a date of establishment of the Mission. On the 31st day of March, 1994 the Mission of the President of Ukraine was established in Crimea by the Decree of the President of Ukraine No. 119/94 and the Permanent Representative of the President of Ukraine was appointed. The structure and limiting number of staff of the Mission was determined by the Order of the President of Ukraine No. 119/94 d.d. the 12th day of May, 1994 (that have been changed several times over the years). 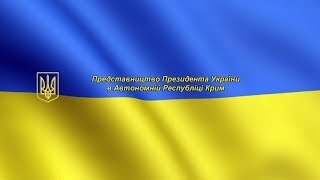 A current name of the Mission of the President of Ukraine in the Autonomous Republic of Crimea was introduced by the Decree of the President of Ukraine No. 100/96 d.d. the 31st day of January, 1996, its powers were extended and the Regulations “On the Mission” that had been implementing within the period prior to adoption of a new Constitution of Ukraine in 1996 was approved by this decree too. The work of the Mission of the President of Ukraine as a state control authority under the Constitution and regulatory legal act of the Autonomous Republic of Crimea, Constitution of Ukraine and laws of Ukraine are fixed in the part 4 of the Article 5 of the current Constitution of the Autonomous Republic of Crimea adopted on the 2nd session of the Verkhovna Rada of the Autonomous Republic of Crimea on the 21st day of October, 1998 and approved the Law of Ukraine No. 350-XIV d.d. the 23rd day of December, 1998. The position powers of the Permanent Representative of the President of Ukraine in the Autonomous Republic of Crimea related to the organization of local government in Crimea are fixed in the part 3 of the Article 37 of the current Constitution of the Autonomous Republic of Crimea of the year 1998. Next changes in the status of the Mission were caused by the constitutional powers of the President of Ukraine as a head of state, guarantor of state sovereignty and territorial integrity of Ukraine, observance of the Constitution and laws of Ukraine, human and civil rights and freedoms. By order of the President of Ukraine No. 68/98-rp d.d. the 27th day of March, 1998, Department for Interethnic Relations was established in the office of the Mission. In pursuance of the Decree of the President of Ukraine No. 573/2000 d.d. the 07th day of April, 2000 the Secretariat of the Council of Representatives of the Crimean Tatar People as a form of recognition of the Mejlis of the Crimean Tatar People by Ukraine was established in the office of the Mission. The Law of Ukraine No. 1524-III determines that the Mission is a state governmental authority established for the purpose of promoting implementation of powers conferred upon the President of Ukraine in the Autonomous Republic of Crimea and is directly subordinate to him/her. This legal instrument determines the functions of the Mission. According to the provisions of this law the Mission is headed by the Permanent Representative of the President of Ukraine in the Autonomous Republic of Crimea. The Permanent Representative and his/her deputies are appointed and dismissed by the President of Ukraine. The main functions of the Mission are the following: representative, nominating, analytical, information and human rights functions that lied in promoting the observance of constitutional rights and freedoms of people and citizens and in achieving the interethnic harmony, social, economic and political stability in the Autonomous Republic of Crimea. After the armed seizure of the Crimean peninsula by the aggressor State in February 2014, the activity of the Mission in the city of Simferopol were forced to cease, the management of the Mission left the occupied Autonomous Republic of Crimea. The world community of civilized nations and the Ukrainian government did not recognize the illegal occupation and criminal annexation of the Crimean peninsula by the aggressor State. The massive and cynical violation of the norms of international humanitarian law and international law of human rights in Crimea by Russia, recognized at the level of legal documents of the United Nations General Assembly, authorities of the Council of Europe, Organization for Security and Co-operation in Europe and the European Union, set before the Ukrainian government fundamentally new tasks concerning the Autonomous Republic of Crimea. By the order of the President of Ukraine No. 865/2014-rp d.d the 16th day of May, 2014 in order to ensure the renewal of activity of the Mission in conditions of temporary occupation of the territory of Ukraine, the Mission was located in the city of Kherson, that is territorially adjacent to the administrative border with the Autonomous Republic of Crimea. On the 24th day of May, 2014, the Decree of the President of Ukraine No. 487/2014 approved a structure of the Mission, which should ensure its work in conditions of temporary occupation of Crimea. The new stage of the Mission’s functioning was determined by the Decree of the President of Ukraine No. 16/2016 d.d. the 20th day of January, 2016. This document has significantly enhanced the human rights and international dimension of the Mission’s activity, provided for establishment of separate structural units of the Mission in the city of Kyiv, with preservation of the location in the city of Kherson. The decree of the President No. 221/2017 d.d. the 17th day of August, 2017 provided for special official duties of the First Deputy Permanent Representative of the Crimean Tatar People. A position of the Chief of Staff of the Mission’s office has been provided in accordance with the new legislation of Ukraine. The Mission clearly defines the directions of work, establishes cooperation with central and regional governmental authorities in Ukraine, introduces a mechanism of regular monitoring of situation connected with the internally displaced persons, performs analysis of legislation in the context of issues connected with Crimea to resolve them; it systematically studies social, economic and political processes on the temporarily occupied territory of Ukraine, provides informational support to all types of its activities. The Mission has been submitting numerous proposals and applications to the President of Ukraine, the Cabinet of Ministers of Ukraine, central executive bodies which are designed to reduce the consequence of temporary occupation and to improve the level of rights and freedoms of people and citizens provided by the Constitution, laws of Ukraine and international treaties.